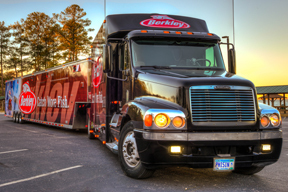 COLUMBIA, S.C. (August 1, 2014) – The Berkley Experience trailer is headed to Philadelphia, Pa., and the B.A.S.S. Elite Series at Delaware River. Consumers are encouraged to flock to arrive August 8 – 10. The trailer will be on hand to entertain and offer great deals to consumers. Pure Fishing, Inc. is a leading global provider of fishing tackle, lures, rods and reels with a portfolio of brands that includes Abu Garcia®, All Star®, Berkley®, Chub™, Fenwick®, Gulp!®, Hardy & Greys™, Hodgman®, Johnson™, Mitchell®, PENN®, Pflueger®, Sébile®, SevenStrand®, Shakespeare®, SpiderWire®, Stren®, Trilene® and Ugly Stik®. Pure Fishing, Inc. operates in 22 countries with a dedicated workforce conversant in 28 languages. Pure Fishing, Inc. is a subsidiary of Jarden Corporation and is part of the Jarden Outdoor Solutions business segment, a leader in developing outdoor and active lifestyle products. Additional information can be found at https://www.purefishing.com.